Therapy Chicago: Do You Listen to Others Openly? 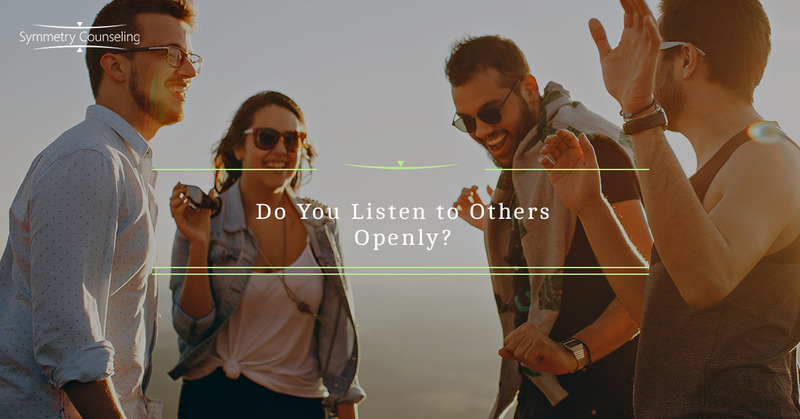 Do You Listen to Others Openly? When we are listening to someone talk, we sometimes tend to day dream and not listen to what they are saying due to many reasons. We tend to get bored, or not agree with what they are saying, and then we tend to go into our own thoughts. Often enough, that individual might as us a question about what they said, and we are unable to answer back because we have not actually been listening. Active listening is a basic tool that helps us keep interested and helps us connect with who we are talking to. In this post, I will explain examples of how to actively listen. Build trust and establish rapport with the individual that you are talking to. Ask them questions and help them understand that you are willing to listen and are going to be supportive of them throughout the conversations. Demonstrate concern by once again asking questions and being open minded to what they are addressing in the conversation. Paraphrase. This means taking what they are saying and change the way they stated. For example, “I have been having a hard time handling my child’s behavior.” You, by active listening, could say, “I hear that you have been having a difficult time managing how your child is acting in various environments.” Adding some extra situations can help them open up and talk more about what is happening. Nonverbal clues are huge because that is how we know someone is understanding what we are saying or if they are actually interested. Nod your head, maintain eye contact, have an open posture, and lean forward to show them that are you interested. Do not cross your arms or look around as that exhibits you are not interested or closed off to what they are saying. Small and quick affirmations are big with active listening. Saying which statements such as “I understand”, “Oh, okay”, or “Thank you for that” can be helpful and gain trust in what they are saying to you. Do not always try to interject too much, as they are the ones that are expressing something to you. Ask open-ended questions. When asking certain questions, it will get the other person to talk more instead of a “yes” or “no” response. For example, instead of saying “Does your child act out of his normal behavior only at school?”—instead, ask, “In what situations or environments does your child not behave?” But at times asking more specific questions can be helpful and show that you are actually listening and comprehending what they are saying. Wait and be patient! This is the hardest thing that we have to go through. Allow the other person to talk instead of interjecting and asking questions, which would not make the other individual feel comfortable talking to you. Let them talk, even allowing some silence while you think and gather thoughts will also allow them to truly think of what they want to say. Do not rush in saying anything. Stop and think before saying. Explain similar experiences. When you are actively listening, you are supposed to be connecting to the individual. Providing situations that have been similar to you are always helpful but being sure that you are not taking away from what they are saying and that you are actually connecting with them. Be brief in what your similar situation is about. If you are interested in learning more about how to actively listen and be more present in conversation, please contact one of our therapists to guide you through this. Active listening is very important in all aspects of life-friendships, romantic relationships, work situations, and even in family dynamics.